Are we sensing a trend? It’s no secret that ammunition prices are increasing. The reasons may be partially due to politics but are more likely due to simple economics: The cost of the raw materials and the labor to turn those materials into bullets and cartridges is increasing. For those of us who enjoy shooting the 1911 pistol in its original .45 Automatic Colt Pistol (ACP) chambering, the effects are (shall we say) significant. Over the past few years, I have watched the price of Winchester USA 100-round value packs at a certain major discount department chain rise from $32 per 100 rounds to $38 per 100. That’s an increase of 18.75 percent. “No problem,” one might say, “just load your own.” Reloading is still cheaper than buying commercial ammunition, but the prices have increased for reloading components, too. A few years ago I was paying $25 per 1000 for Winchester large pistol primers. The price at the same shop today is $40 per 1000, an increase of 60 percent. The prices of bullets and powder have increased proportionately. People who like to shoot a lot are always looking for ways to shoot more for less money. Increasingly, at least in the 1911 universe, people are turning to complete .22LR caliber pistols that outwardly appear to be 1911s, as well as conversion kits that allow the use of a shooter’s favorite 1911 receiver with a .22LR slide and barrel. Conversion kits of this type are offered by several companies who sell only the conversions, as well by a few 1911 manufacturers who buy third-party conversions and resell them under the brand name. Kimber, on the other hand, has elected to manufacture and sell their own .22LR model. In fact, Kimber sells a complete .22LR pistol, as the Kimber Rimfire, and they also sell a conversion kit that allows an owner of a 1911 to buy only the rimfire conversion assembly for use on his or her own receiver. 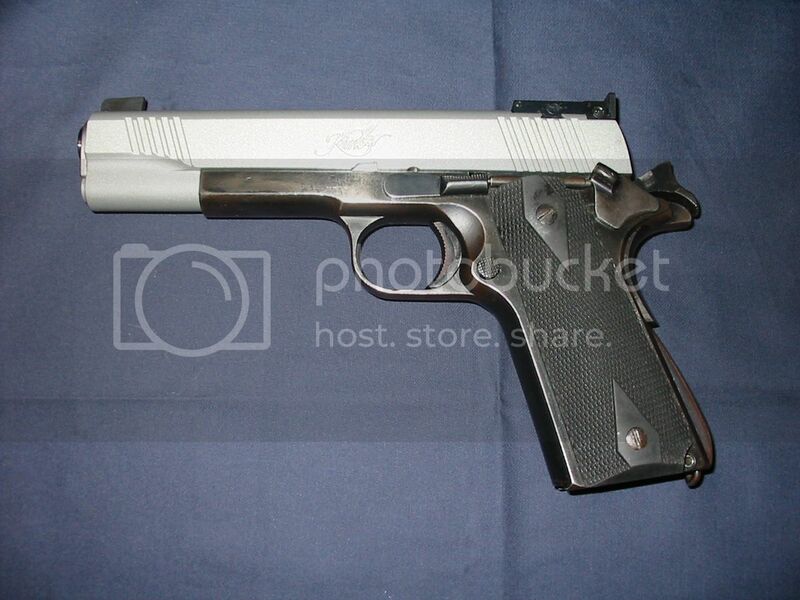 The subject of this review is the Kimber Rimfire Target Conversion Kit. A close personal friend owns a Kimber Rimfire (the complete pistol), and I have been allowed to shoot it on more than one occasion. The pistol is easy to shoot, exceptionally accurate … and I don’t like it at all. The reason is that Kimber elected to use both an aluminum alloy receiver and an aluminum alloy slide in their complete Rimfire pistol. 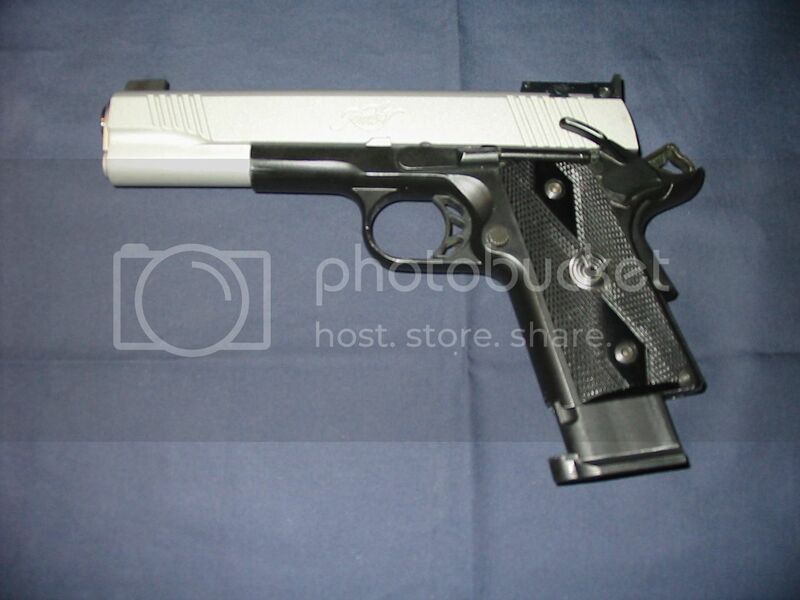 The result is a pistol that is so light that, to me, it feels like shooting an airsoft rather than a real firearm. Curiously, the owner of the Kimber Rimfire pistol is a “large economy size” individual with hands the approximate size of an Easter ham, and he enjoys shooting the Kimber Rimfire. 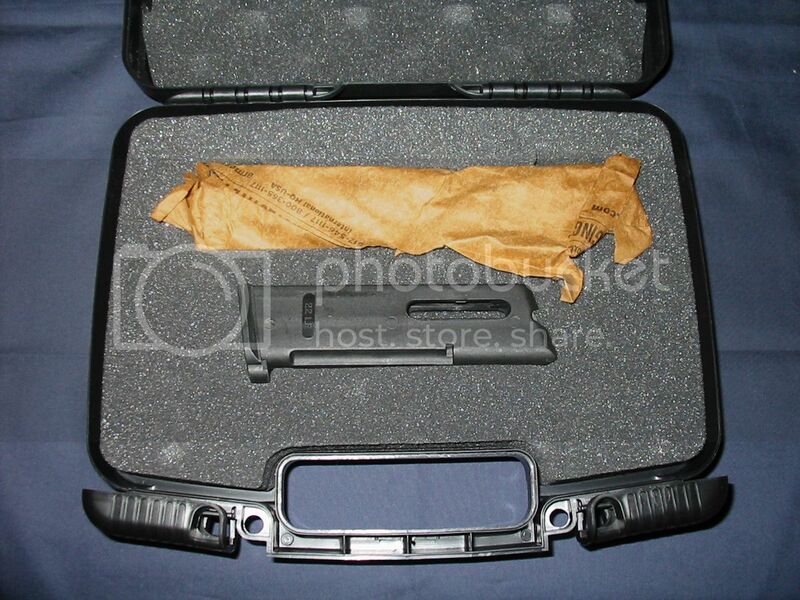 The Rimfire Target Conversion Kit arrives in a decent quality clamshell pistol case. Inside, nestled into cutouts in the foam inserts, are the slide/barrel assembly (fully assembled and ready to go) and a single magazine. An instruction book is tucked under the foam insert. Diving right in, we quickly discovered that the conversion slide assembly field strips just the way intuition led us to expect. The size and shape of some of the parts (such as the recoil spring plug) are different from the corresponding parts in a centerfire 1911 but, overall, the parts go together in much the same fashion. The Kimber Rimfire slide, for example, is set up with a conventional barrel bushing, which is removed from the slide in the traditional way. Like most .22LR Rimfire conversions for the 1911, the Kimber conversion operates as a direct blowback pistol rather than locked breech, like the centerfire pistols. In common with most .22LR conversions, this means that there are no locking lugs in the slide or on top of the barrel, and the barrel has no link to pull it down out of lock upon recoil. 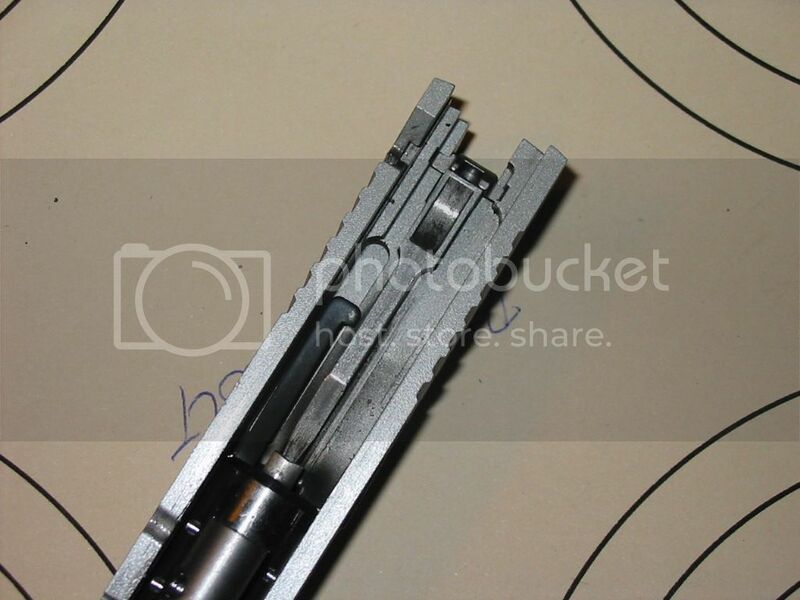 The barrel remains fixed in place, retained by the slide stop pin through a hole in the solid underlug of the barrel. 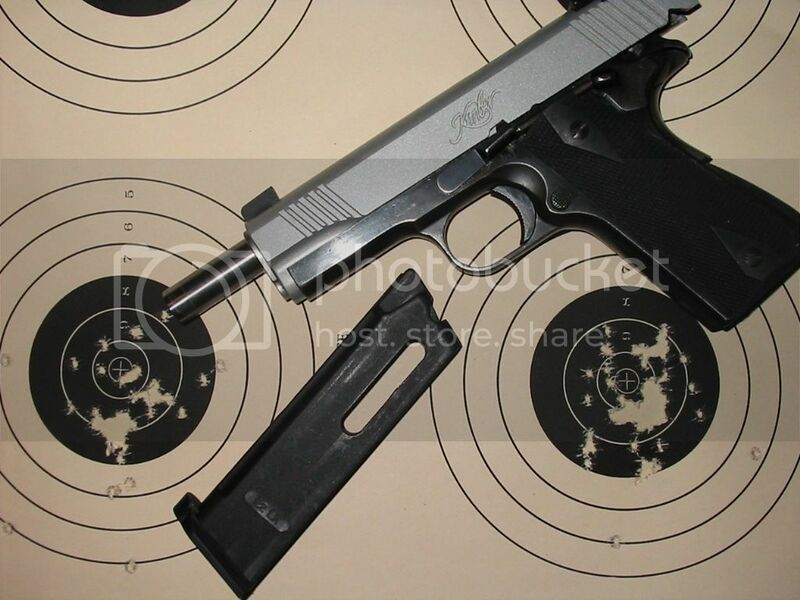 The Kimber uses an external extractor, which is also somewhat standard practice with .22LR conversions for the 1911. The centerfire ejector can be left in place on the receiver, but the conversion has its own Rimfire ejector incorporated into the barrel assembly. Everything is assembled as the kit comes out of the case; all that’s needed to install it on a receiver is to remove the centerfire slide and barrel, apply a few drops of oil to the slide rails, and install the conversion kit slide assembly. 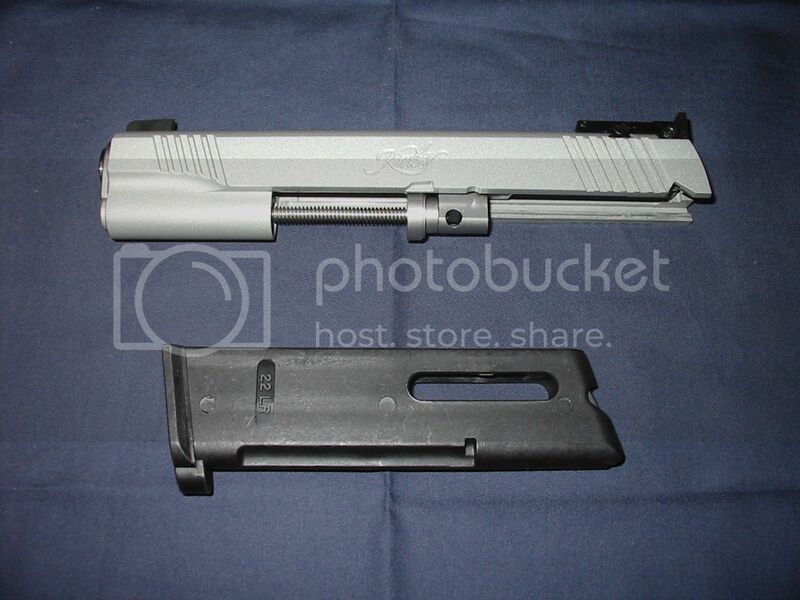 The Kimber Rimfire Target Conversion Kit has a standard-length (5-inch) slide. We wanted to review the conversion on a receiver for a full-size pistol. However, in competition I shoot double stacks, and Kimber does not offer a double stack magazine. 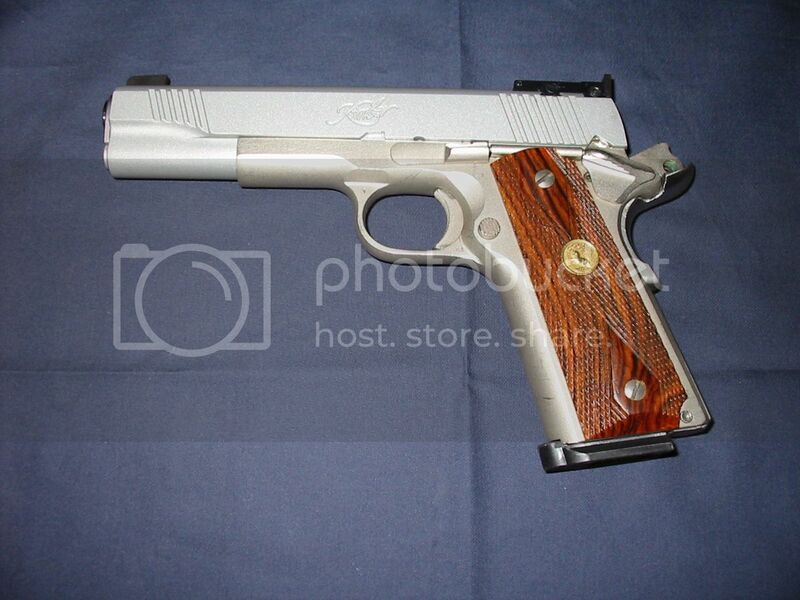 For personal defense, I carry pistols in the 3-inch to 3½-inch range. Ultimately, we decided that a good test of how the Kimber conversion might function on “anyman’s” pistol would be to use the receiver from an Argentinean Sistema Modelo 1927. These were built in Argentina under license from Colt and are widely regarded as excellent quality copies of the M1911A1 military pistol. The Kimber slide fit right onto the rails of the test Sistema receiver and slid back smoothly … a little over halfway. At that point, the conversion slide simply stopped cold. It didn’t require Inspector Clouseau to figure out that the Kimber slide wasn’t cut quite deep (high) enough to clear the top of the Sistema’s ejector. It took only a moment’s reflection to conclude that I own the Sistema, and I did NOT own the Kimber conversion. Discretion being the better part of valor, I felt it was better to whack on my own property than on a new conversion on loan from the manufacturer. Two very light passes with a file along the top surface of the ejector resolved the problem, and the conversion kit then went onto the Sistema receiver with virtually no vertical or horizontal slop. For the record, we also fitted the same conversion slide to a Colt Commander receiver, a Colt M1991A1 Compact receiver, and a Para-Ordnance Slim Hawg receiver. We encountered no ejector interference with any of those pistols. 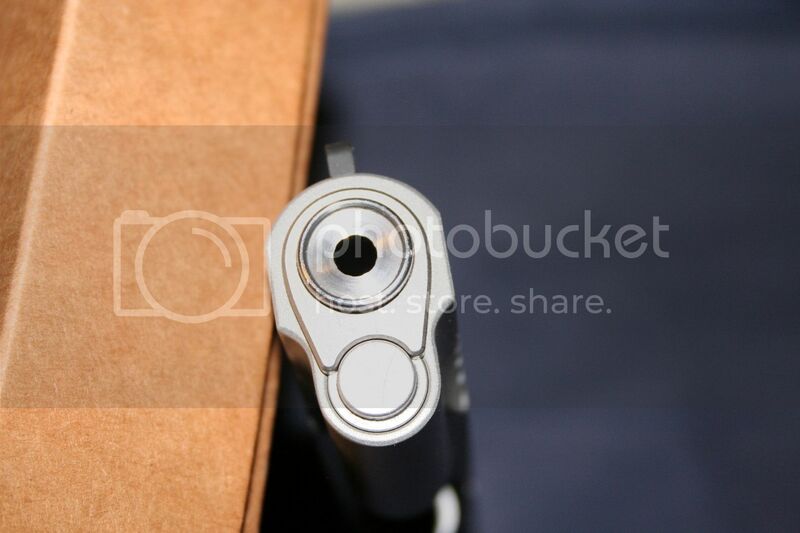 The barrel has a nicely finished, recessed crown to protect it from damage that could affect accuracy. Comparing the conversion slide to a standard, 5-inch 1911 .45 caliber slide (which, again, is made to standard M1911A1 dimensions), we found that the slide apron, or recoil spring tunnel, on the conversion is significantly longer than that of the centerfire slide. The extra length allows the conversion to be used on Commander and Officer size receivers, with their shorter front dust covers, without leaving an unsightly gap between the slide and the receiver. When our M1911.ORG e-zine was first launched, we established as a test protocol that full-size (5-inch) and Commander-length (4¼-inch) pistols would be fired for accuracy at a distance of 75 feet, and that shorter pistols would be tested at a distance of 25 feet. We weren’t thinking about .22LR pistols or conversions at that time. When we subsequently evaluated some .22LR pistols made in the size and shape of full-size 1911s, we simplistically tested them at 75 feet because … well, because they had 5-inch slides, and that’s what we do. We might have stopped to consider that 50 feet is a standard distance for Rimfire target competitions and tested the Rimfire pistols at that distance, but we didn’t. Consequently, in order to be able to compare the results of the Kimber Rimfire Target Conversion against previous tests of .22LR pistols, we shot the Kimber conversion at a distance of 75 feet. Accuracy testing was fired over a rest, from a seated position at a bench. We fired multiple 5-shot groups with each type of ammunition included in the test, and discarded the worst shot out of each group. The accuracy results include the single best group as well as an average of the three best groups for each type of ammunition. Initially, we found that the sights were pretty much correct for windage but our initial test group with Remington Thunderbolt was impacting several inches below point of aim. Two adjustments of several clicks each brought point of impact up to point of aim, and we could then proceed with our testing. the best four shots were measured. Average represents the average of the best three groups. here in order to more completely identify exactly what each type is. Our grab bag of ammunition included the above, plus a box of Remington Subsonic .22LR. It was our intention to include the Subsonic in the test. However, we found that the CCI standard velocity ammunition didn’t generate enough energy to reliably cycle the slide. Since the Remington Subsonic has even less muzzle velocity, we decided that trying to use it in the conversion would not be productive. Before the accuracy portion of this evaluation began, we took the Kimber conversion on the Sistema receiver to the range for an evening of shooting with several co-workers, all of whom were only too happy to try it out. Nobody made any serious efforts at attaining maximum accuracy during that range session, but with four people shooting the conversion we probably put between 200 and 250 rounds through it with no stoppages or malfunctions, using a variety of high-velocity .22LR ammunition from several different makers. It came as a surprise, then, when part way through the accuracy portion of our evaluation we began to experience random failures to feed. When these occurred, they were complete failures to feed. The slide cycled and closed normally, the disconnector reset, the trigger pulled and the hammer fell. But … the hammer produced a “click” rather than a “bang.” Partially retracting the slide after these clicks invariably revealed that there was no round in the chamber; the next round was sitting well down in the magazine, below the point where the advancing slide could strip it from the magazine and chamber it. This occurred (at random) with multiple types of ammunition, and it was irregular enough that we couldn’t attribute any pattern to it. After returning to the man cave, we played with the magazine and noticed what seemed to be a slight “hitch” in the movement of the follower in the tube. 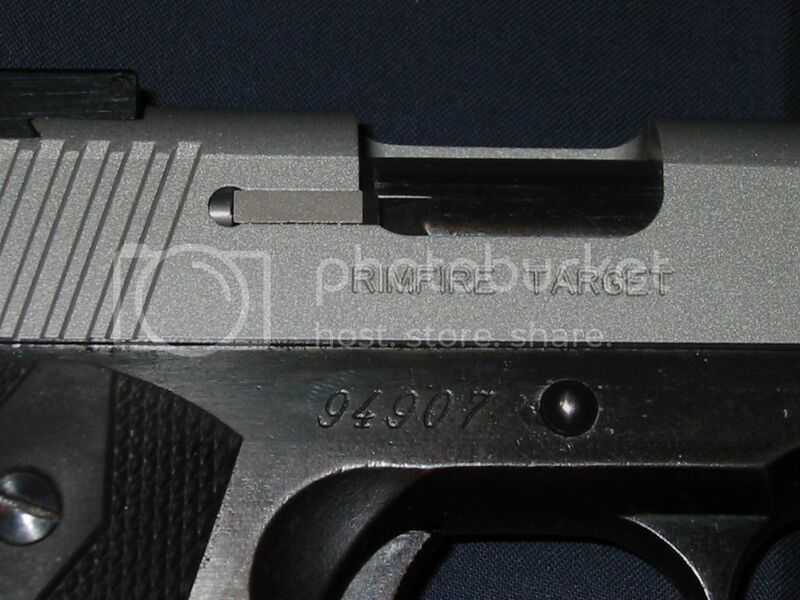 It should be noted that the Kimber conversion uses polymer magazine bodies as well as followers. Thinking that perhaps polymer doesn’t slide well against polymer, we disassembled the magazine and used a small piece of 600-grit emery paper to polish the sliding surfaces of the follower. We also dusted on some powdered graphite when the magazine was reassembled. 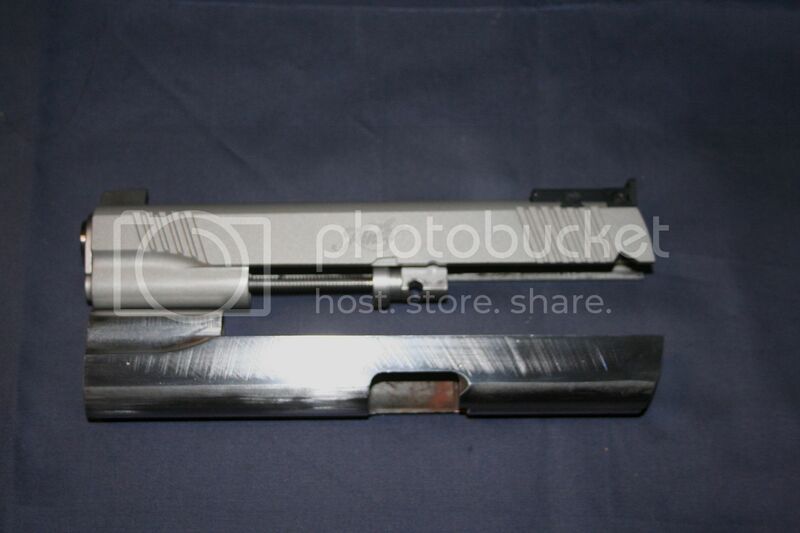 We also reported the hang-ups to Kimber, and the factory immediately sent a spare magazine to use for comparison. Kimber also suggested that they thought the problem might be attributable to the Sistema receiver being out of spec, but (a) the likelihood of a Sistema receiver being out of spec is remote, and (b) given that the mode of failure was that the next round didn’t rise high enough in the magazine to make contact with the slide, we think it is more reasonable to blame the magazine. This was born out when we were able to return to the range, with a fresh supply of Remington Thunderbolt and both magazines. We ran a full box (50 rounds) through each of the two magazines. The original magazine (the one we "massaged") performed flawlessly. With the replacement magazine, we experienced a couple of failures to feed in the first group of ten rounds, and then no problems thereafter. As is the case with almost all rimfire pistols and conversions, the slide does not lock open after the last shot has been fired. Unless the shooter counts how many rounds have been fired, "empty" is signaled by the pistol making a click rather than a bang. This has always worried me about my own .22LR conversion because I have always been told that dry firing a rimfire causes damage to the mouth of the chamber, and possibly to the firing pin as well. I was very surprised, then, to see in the Kimber owner's manual that dry firing is acceptable. This meant that it wasn't necessary to be so careful about counting shots that I lost focus on what I was trying to do -- hit a target. In preparing for the arrival of the Kimber Rimfire Target Conversion Kit, it was only natural to go to Kimber's web site to read about it. One statement leaped off the page at us: Kimber says the Rimfire Target Conversion is not for use on pistols that have ramped barrels. This was puzzling, because we know that at least one of Kimber's competitors sells a version of their .22LR conversion with double stack (size) magazines, for use in Para-Ordnance pistols ... which, until the recent introduction of the GI Expert series, all had ramped barrels. We asked our contact person at Kimber about this, and the answer was that the cut in the frame for the ramped barrel may interfere with feeding. We anticipated that some of our readers will want to know if it can be done anyway, so we tried it. 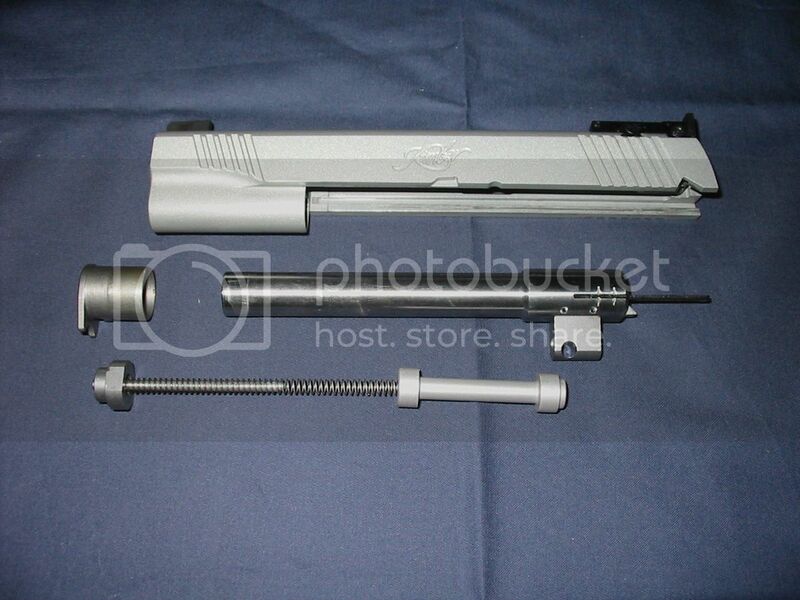 We were able to obtain the use of a single stack Para-Ordnance Slim Hawg, with a ramped barrel. 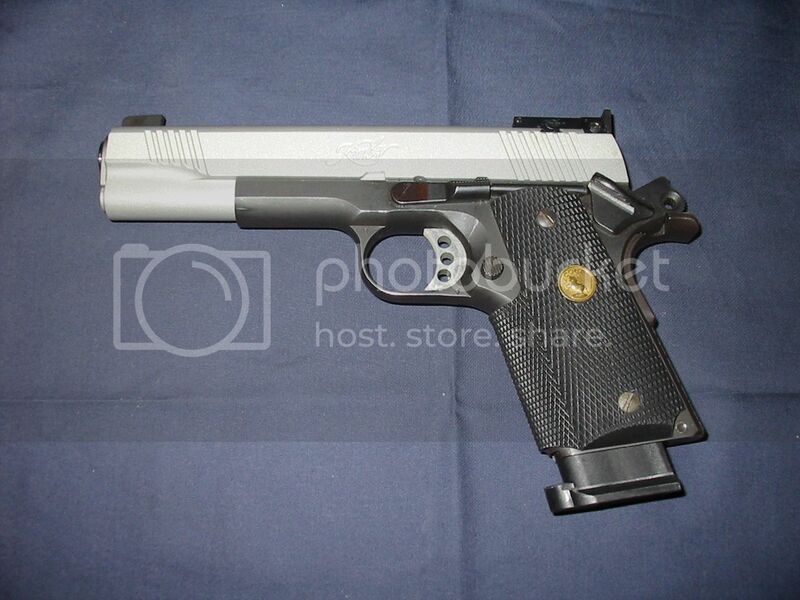 The Kimber conversion went right onto the Para receiver. The Kimber barrel has its own integral feed ramp, and we found that the top round in the magazine is held well above the cut in the receiver in order to align properly for feeding onto the ramp of the conversion barrel. We fired a full box of fifty rounds through the conversion on the Para receiver and didn't experience any failures to feed. It functioned flawlessly. I hope the good folks at Kimber won't shoot me for reporting this. Please keep in mind that Kimber clearly states the conversion is NOT suitable for pistols with ramped barrels. If anyone wishes to try this, they are on their own dime and should not contact Kimber if there's a problem. That said, based on our experience I believe there's an excellent probability that it will function. In addition, it should be noted that all Para-Ordnance pistols utilize a firing pin safety mechanism modeled after the Colt Series 80. When we installed the Kimber conversion on the Para-Ordnance receiver, we did not remove or modify the two frame levers that actuate the plunger in the slide. In fact, the underside of the conversion slide is milled out on both sides of the disconnector notch, providing sufficient vertical clearance for the safety lever to operate without interfering with the travel of the conversion slide. 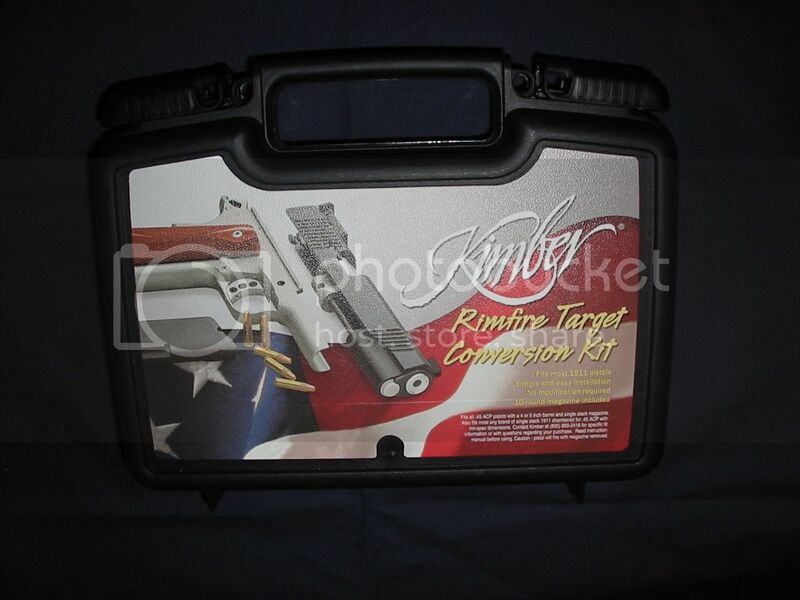 The bottom line is that we liked the Kimber Rimfire Target Conversion Kit a lot. It is easy to install, it is easy to maintain (since it field strips as one would expect any 1911 slide to field strip), and it is very accurate. Mounted on a steel receiver, the resulting package has sufficient weight to feel like a real pistol rather than a toy when shooting. For those who shoot a lot, replacement springs are readily available from Kimber. As a final demonstration of the conversion's capabilities, the two targets shown below were fired at a distance of 25 feet when we were testing the magazines for function and reliability. Each target represents a full box of 50 rounds of Remington Thunderbolt. In shooting these targets, we were firing moderately rapidly. We were aiming, but our purpose was to push rounds through the magazines so we weren't spending 30 seconds per shot (or anything close to that). These targets are representative of what the Kimber Rimfire Target Conversion can produce in casual plinking. As always, we are especially grateful to Chris Dogolo, Mike Rubino, and Charlie Baker at Chris’ Indoor Shooting Range for their assistance and cooperation in allowing us the use of the range for testing. All times are GMT -4. The time now is 20:03.